KIEV, Ukraine -- Ukrainian prosecutors said Thursday they are considering filing charges against parliament members who hurled eggs and set off smoke bombs in the chamber as lawmakers ratified a controversial agreement with Russia. Ukrainian opposition and pro-presidential lawmakers fight during ratification of the Black Sea Fleet deal with Russia, in parliament in Kiev, Ukraine, Tuesday, April 27, 2010. 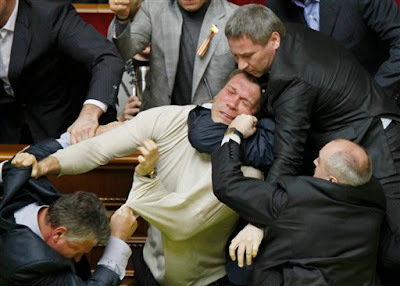 The parliament speaker was bombarded with eggs and deputies brawled Tuesday before a vote ratifying an agreement to extend the Russian navy's lease of a Ukrainian port by 25 years. Kiev city prosecutors said Thursday that those who caused the disorder could face charges of hooliganism, which carry a sentence of up to four years in jail. President Viktor Yanukovych and Russian President Dmitry Medvedev signed the ratified deal on the Black Sea Fleet into law on Thursday. The deal is the most concrete sign of Russia's renewed influence in Ukraine since Viktor Yanukovych became president in February. Yanukovych replaced Viktor Yushchenko, who adamantly pushed to move Ukraine out of Moscow's shadow and integrate more closely with Western Europe. Yushchenko opposed a Black Sea Fleet lease extension.